NEW YORK, New York, October 2, 2009 – Miracle Corners of the World (MCW), a nonprofit organization that empowers youth to be positive agents of change in their communities, honored Tanzanian President Jakaya Mrisho Kikwete at a special dinner in New York City last week joined by the Minister of Health and Social Welfare Professor David Mwakyusa. The event gave the president and minister the opportunity to meet MCW’s community of friends and supporters, and to highlight the East African country’s healthcare priorities. In his remarks, the president expressed his appreciation for MCW’s work in re-equipping the clinics at the Muhimbili University of Health and Allied Sciences’ Dental School (MUHAS) in Dar es Salaam. He also stressed the need to improve the country’s maternal healthcare capabilities and challenged the dinner attendees to help Tanzania tackle the problem, noting that many deaths could be prevented through simple interventions. The event was organized and hosted by the Bergman family, including Henry Schein Inc. Chairman and CEO Stanley Bergman and MCW Healthcare Projects Director Dr. Marion Bergman, as well as MCW Co-founder and Executive Director Eddie Bergman, at their private residence. According to the Ministry of Health and Social Welfare, Tanzania’s maternal death rate is 578 deaths per 100,000 births (2004 figures). It has been estimated that close to 9,000 Tanzanian women die of childbirth and pregnancy-related causes annually. More than 70 guests, all supporters and friends of MCW, attended the event, including UN Deputy Secretary General Dr. Asha-Rose Migiro, who was born in rural Songea, where MCW opened its second youth center in 2005, World Bank Africa Region Vice President Obiageli Ezekwesili, Tanzanian Foreign Affairs Minister Radhia Msuya, Tanzanian Ambassador to the U.N. Dr. Augustine Mahiga, and Tanzanian Ambassador to the U.S. Ombeni Sefue. Non-profit organization leaders from the American Jewish World Service, the Institute for Healthcare Improvement, the International Crisis Group, Physicians for Human Rights, and the Synergos Institute also attended the dinner, alongside representatives from the private sector, including the Midmark Corporation, one of the major donors to the Dental School. 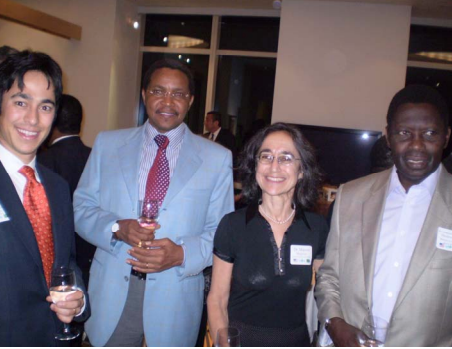 The dinner precedes the opening ceremony of the upgraded MUHAS facility to be held on November 2, 2009 in Dar es Salaam. President Kikwete is scheduled to officiate the event, which coincides with the school’s 30th anniversary. For more information about the ceremony, contact MCW at info@miraclecorners.org. About Miracle Corners of the World (MCW) Founded in 1999, Miracle Corners of the World is a non-profit organization that empowers youth to become positive agents of change, to improve their lives and contribute to their communities. Based in New York, MCW serves youth worldwide through its three programs: Youth Leadership, Oral Healthcare, and Partner Initiatives. For more information, visit www.miraclecorners.org.